Studio 8 has released some brand new photos from their upcoming crime drama based on true events, White Boy Rick. Check out the White Boy Rick photos in the gallery below and let us know what you think. 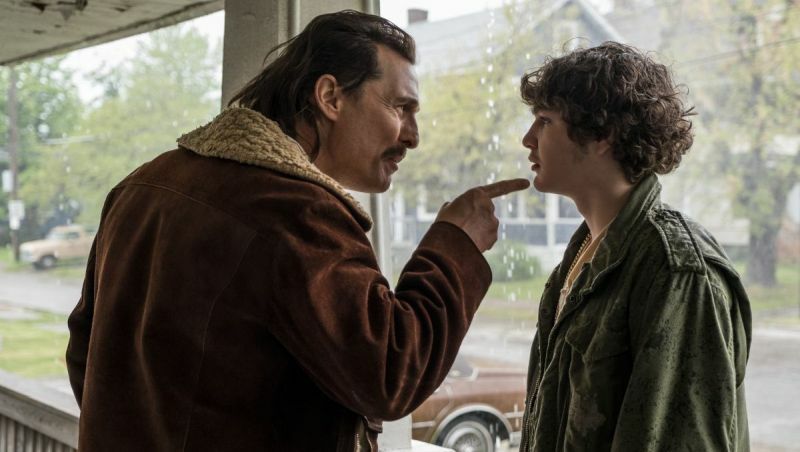 Based on true events, White Boy Rick is set in 1980s Detroit at the height of the crack epidemic and the War on Drugs, and tells the moving story of a blue-collar father and his teenage son, who became an undercover informant and later a drug dealer, before he was dropped by his handlers and sentenced to life in prison. 15-year-old Richie Merritt was discovered in Baltimore during an extensive nationwide talent search. Hailing from a similar socioeconomic background as Wershe, Merritt’s natural talent, charisma and authenticity impressed the filmmakers, as well as his chemistry with Matthew McConaughey who plays his father. White Boy Rick also features Oscar nominee Jennifer Jason Leigh (The Hateful Eight) and Rory Cochrane (Black Mass) as the FBI agents who begin working with Rick as a confidential informant, and Brian Tyree Henry (FX’s Atlanta) as narcotics detective Officer Jackson; two-time Oscar nominee Bruce Dern (Nebraska) as Rick’s grandfather, Ray Wershe; three-time Oscar nominee Piper Laurie (Carrie) as Rick’s grandmother, Verna Wershe; BAFTA nominee Bel Powley (Diary of a Teenage Girl) as Rick’s sister, Dawn; Jonathan Majors (Hostiles) as Johnny Curry; Rapper YG (Blame It on the Streets) as Leo Curry; RJ Cyler (Me and Earl and the Dying Girl) as Rudell Curry; Taylour Paige (VH1’s Hit the Floor) as Cathy Volsan; and Kyanna Simone Simpson (Fist Fight) as Brenda. The film is directed by Yann Demange (’71), from a script by Andy Weiss and Logan & Noah Miller. The film is being produced by John Lesher (Birdman), Julie Yorn (Hell or High Water), Darren Aronofsky (mother!) and Scott Franklin (Black Swan). Executive producers are Georgia Kacandes, Ari Handel, Matthew Krul, Christopher Mallick, Michael J. Weiss, Logan Miller and Noah Miller. The post New White Boy Rick Photos Released! appeared first on ComingSoon.net.